Tim Wilson left behind a career in the credit card world to pursue an enology education at California State University Fresno. He developed his winemaking skills at Chateau Ste. Michele, Edna Valley Vineyard, Benton-Lane Winery and Dobbes Family Estate. 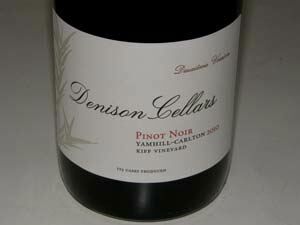 In 2009 he launched his own label, focusing on Pinot Noir from small, sustainably-farmed vineyards. Tim's spouse, Denise, is also closely involved in the new winery. The initial vineyard partner was Kiff Vineyard located in the Yamhill-Carlton AVA. The 8-acre vineyard is planted to Dijon 667 and 777 and Pommard clones. Tasting is available in Carlton at Republic of Jam and in McMinnville at Biggio Hamina Cellars. The 2009 Kiff Vineyard Pinot Noir is sold through the winery's online store.